HUELL HOWSER. Photo by Bohdan Zachary. 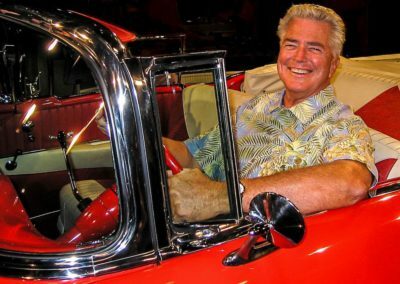 KCET public television station will air some fan-favorite food-themed episodes from “Visiting with Huell Howser” beginning Sun., Sept. 2 in honor of the 25th anniversary of Howser’s beloved program. Some of the episodes include visiting Pink’s Hot Dogs, Talleyrand and Porto’s Bakery. 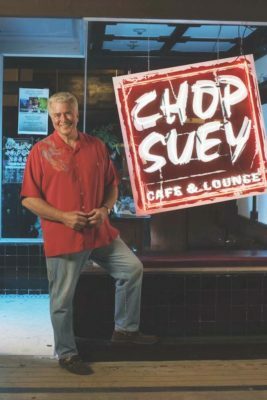 CHOP SUEY was one of the restaurants covered by Huell Howser. KCET will kick off the celebration with several giveaways at the “Los Angeles Times’” Taste event at Paramount Studios’ backlot Fri., Aug. 31 through Sun., Sept. 2, 7:30 to 10:30 p.m.
A Tennessee transplant, Howser, who died in Palm Springs in 2013, began his career in Los Angeles working for Hancock Park resident (and then KCBS general manager) Jamie Bennett as a feature reporter at the station. HUELL HOWSER visits the Chronicle offices December 2007. From left to right are Howser, Jane Gilman and Laura Eversz. Pam Rudy is seated. Nancy MacCoon is at far right. Besides living in Palm Springs and Joshua Tree, he also resided around the corner from the Chronicle at the El Royale on Rossmore Avenue. In his 2013 obituary, publisher Jane Gilman wrote about how his booming voice often signaled his arrival at the paper’s offices. 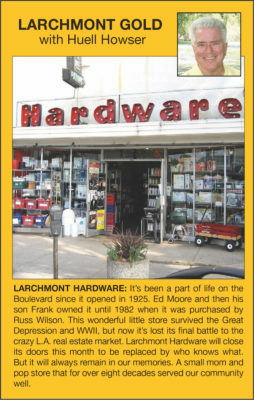 LARCHMONT HARDWARE was featured in Howser’s Dec. 2007 Larchmont Chronicle column. From May 2007 to April 2008, Howser wrote a column in the Larchmont Chronicle, titled “Larchmont Gold,” covering businesses on the boulevard such as Larchmont Hardware, the Larchmont Barbershop and Chevalier’s Books. Locals that he visited for his TV show included Brothers Collateral, Larchmont Cleaners and Village Pizzeria. Most of Howser’s programs and records were donated to Chapman College in Orange, where there is now an exhibit of the “California Gold” series and other Huell Howser materials that is free and open to the public. Archives are also available online. Last year, Howser was the topic of the memoir “Louie, Take a Look at This! My Time with Huell Howser,” by cameraman Luis Fuerte and David Duron.